The Lockerbie String Quartet has delighted Midwest audiences since 1982, concertizing as one of the premiere string quartets based in Indiana. The quartet has held residencies at the Indianapolis Museum of Art and at Butler University, as well as being a participant in the Indiana Arts Commission’s Touring Program. 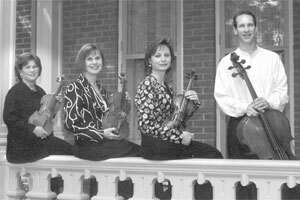 Players in the quartet are: Kara Day Spurlock, violin; Ginny Womack, violin; and Donna Lively Clark, viola; who together perform in the Indianapolis Chamber Orchestra. The cellist, Kurt Fowler, is professor of cello at Indiana State University, and a member of the Indianapolis Baroque Orchestra.